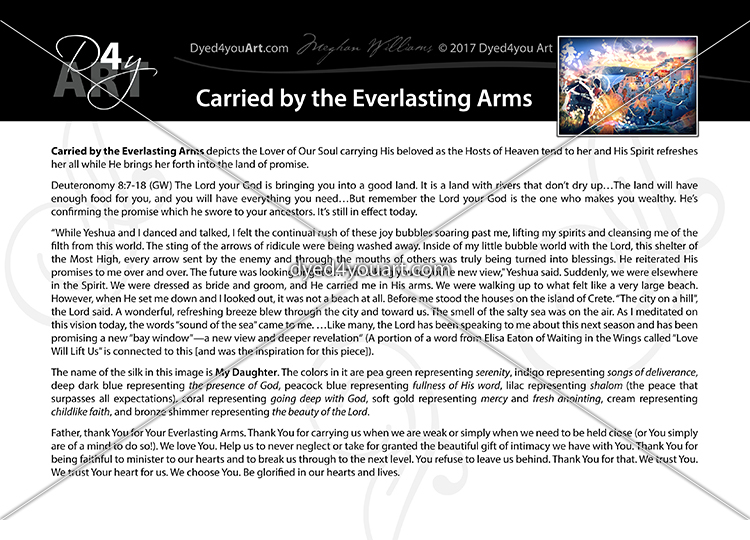 Carried by the Everlasting Arms depicts the Lover of Our Soul carrying His beloved as the Hosts of Heaven tend to her and His Spirit refreshes her all while He brings her forth into the land of promise. Deuteronomy 8:7-18 (GW) The Lord your God is bringing you into a good land. It is a land with rivers that don’t dry up…The land will have enough food for you, and you will have everything you need…When you have eaten all you want, thank the Lord your God for the good land he has given you. Be careful that you don’t forget the Lord your God. Don’t fail to obey his commands, rules, and laws that I’m giving you today. You will eat all you want. You will build nice houses and live in them…When this happens, be careful that you don’t become arrogant and forget the Lord your God, who brought you out of slavery…He did this in order to humble you and test you. But he also did this so that things would go well for you in the end. You may say to yourselves, “I became wealthy because of my own ability and strength.” But remember the Lord your God is the one who makes you wealthy. He’s confirming the promise which he swore to your ancestors. It’s still in effect today. A portion of a word from Elisa Eaton of Waiting in the Wings called “Love Will Lift Us” is connected to this (and was the inspiration for this piece). …He reached between the veil of heaven and earth, and I felt Him grab me and hold me! Miracle of miracles, I cried softly in this world yet, in the Spirit, perfect love held me in His arms! I relaxed a little and rested a bit more with His comfort. After a few minutes, I heard in the Spirit, “What’s the rush? Exhilarating.” Then over and over, I kept feeling this rush of wind and energy over my entire being going from head to toe. I felt like I was on Star Trek, and I was being “beamed up” or “energized”—literally energized! With wave after wave, I felt lighter and lighter. Then in the Spirit, I saw angels dancing around me in a circle. I have been seeing this for several days now. Angels will just appear around me in a circle, hemming me in. I knew this represented God’s whirlwind as well as His hedge of protection surrounding me. “I’m taking you to you’re new view,” Yeshua said. Suddenly, we were elsewhere in the Spirit. We were dressed as bride and groom, and He carried me in His arms. We were walking up to what felt like a very large beach. However, when He set me down and I looked out, it was not a beach at all. Before me stood the houses on the island of Crete. “The city on a hill”, the Lord said. 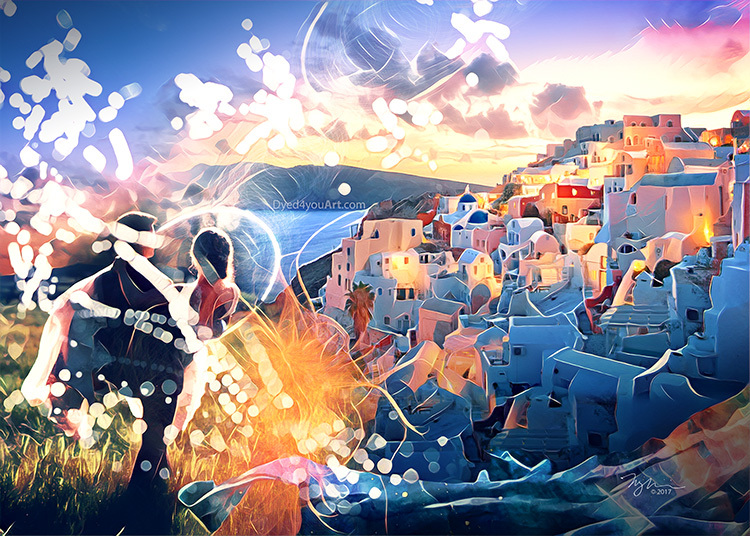 A wonderful, refreshing breeze blew through the city and toward us. The smell of the salty sea was on the air. As I meditated on this vision today, the words “sound of the sea” came to me. …Like many, the Lord has been speaking to me about this next season and has been promising a new “bay window”—a new view and deeper revelation. Song of Songs 1:2 (TPT) Let him smother me with kisses—his Spirit-kiss divine. So kind are your caresses, I drink them in like the sweetest wine! Beloved, receive My fresh flow from heaven. For I AM pouring out My love like the sweetest of wine to minister to your heart. Heady and intoxicating – be swept away in the rushing flow as you surrender to My love. Persistent and irresistible, yield to My heart, beloved. You have nothing to fear from Me, for I love you with a passionate intensity beyond your wildest imaginings. You are the apple of My eye and immeasurably precious to Me. Drown in My affections and be made whole. Psalm 96:6 (TPT) Breathtaking brilliance and awe-inspiring majesty radiate from his shining presence. His stunning beauty overwhelms all who come before him. Beloved, abide in My presence. Be overcome by My glory. Allow the beauty of My majesty to stir within you greatness and inspiration. Let My anointing drip down like rain from heaven over you – saturating and bringing life. Reflect Me, precious one. You are made in My image. My children stand like fields of glory reflecting My face and bearing My name. Refuse to hold back. Choose to be who I made you to be, for you are lovely beyond description and Mine forevermore. A portion of a word from Lana Vawser called “Incredible Breakthrough, Blessing, Increase and Abundance Is Upon Us, and in the Midst of the New Promised Land I Heard Him Release a Warning.. “Don’t Forget Me”” is connected to this. The Lord is bringing you into a good, new land. It is a land that is going to be a land of refreshing. There is going to be new wine, there is going to be healing, there is going to be increase, there is going to be abundant provision – the camels are coming. There is going to be financial increase for many of you. There is going to be favour, opportunity, increase, blessing upon blessing, hearts desires fulfilled, tremendous fruitfulness and your heart is going to DELIGHT and BE SATISFIED in all that the Lord releases in you and to you. His heart is for you to THRIVE in your new land. In this new land of blessing, of provision, of increase, stay close to His heart and seek His strategy. Seek His guidance and His WAY to steward all that He is releasing. For in this new land, there will be many opportunities, but the Lord is encouraging us to continue to choose Him and choose to obey His voice, no matter how sparkly the opportunity is that comes. Do not forget the commands of the Lord, do not forget the strategy that He has given you. Do not forget to hold to His decrees. For the “pathways” in this new land of significant increase, may be completely different to what you expect and the Lord may have you “go against the grain”, but I encourage you to OBEY His voice even when you don’t understand…. Be intentional to come away with Him and remember what He has done and from where you have come. There is a glorious new depth of intimacy awaiting you in your new land of promise. The Lord wants you to be filled with great joy, your heart glad and rejoicing in your blessing and the increase He is releasing upon you, but He also wants you to stay in the place of deep communion with Him. He wants to develop your union with Him in greater ways in the land of blessing. The Lord whispered to me…”Many know how to steward the deep place of intimacy in hardship and trial and at times lack, but few know how to steward the deep place of intimacy in the increase, in the blessing and in the abundant favour.” He wants to teach us in a whole new and fresh way how to steward increase and blessing with integrity, humility and purity and I believe that is why it is so imperative as He leads us into these new lands of increase and blessing that we are sowing into the secret place of knowing Him, delighting in Him, our beautiful Jesus, as our true source, our first love, our all in all, more than EVER before. I saw many of God’s people swimming in the rivers of the Spirit at depths they had never experienced, moving in such a powerful flow of revelation of His Word and who He is as they stayed deep in the secret place. A whole new realm of flowing with Him, the leading of His Spirit and being sensitive to heaven’s strategy. The land before you is BOUNTIFUL, and in His heart and the secret place, He will teach you to steward it and enjoy it with great joy!!!! Beloved, you are precious in My sight. Never forget My love for you or let your circumstances or the world at large cause you to question it. It is firm. Solid. Everlasting. I AM Olam Zeroa, the Everlasting Arms. You are forever wrapped tightly in My embrace. Feel My love, precious one. Pause and feel it. Beloved, you are not alone. I AM with you and I will never leave you. Though there may be times your earthly family lets you down, I will never leave you or forsake you. I have chosen you and will never let you go. I hold you close in your times of need, and I send others to be a blessing on My behalf. Beloved, embrace those I put in your life. Allow those divine connections to nurture your spirit and build you up. Allow them to reflect My heart to you and speak life over you. Allow them to clearly reflect back to you the truth of who you are rather than a distorted perception. But even in these special friendships that are a gift from Me, remember that though they may reflect Me and act on My behalf, they are not Me and cannot act as a replacement. I work through them, but ultimately the love you seek is found in Me. I know the truth about you and believe it unwaveringly. I know that you are precious, you are worth knowing, and you are worth loving. You are beautiful, cherished, and My heart for you is steadfast. But most of all, I have claimed you and called you My own. So, beloved, rest and know that you are Mine. Psalm 63:8 (TPT) With passion I pursue and cling to you. Because I feel your grip on my life, I keep my soul close to your heart. Beloved, pursue Me as I pursue you – fervently and with your whole heart. Just as your lungs cry out for air when deprived of it, so your soul cries out for Me. So breath Me in deeply, beloved. I AM here and I AM rich with love for you – ready to saturate your senses and overwhelm you in the sweetest of ways. Remember, beloved, that your choices and actions clearly indicate your focus. Choose wisely and with intention. Make Me your holy obsession. I AM worthy of your all, and I lavish My love upon those who choose Me. Song of Songs 4:10 (TPT) How satisfying to me, my equal, my bride. Your love is my finest wine—intoxicating and thrilling. And your sweet, perfumed praises—so exotic, so pleasing. Beloved, do you know how you move Me? Do you know how your affections minister to My heart? My love for you is powerful and overwhelming, but surely you must know that yours is equally affecting to Me. You are My deepest desire – the apple of My eye, for you to choose Me and pursue Me is the sweetest of gifts! Let’s stay enthralled with one another – just as newlyweds exist in a place all their own even in a crowded room. Let’s abide in that place where nothing can intervene – where our gazes stay locked together even as the world goes on around us and life’s distractions won’t steal the focus. Come, beloved, and get lost in love with Me. 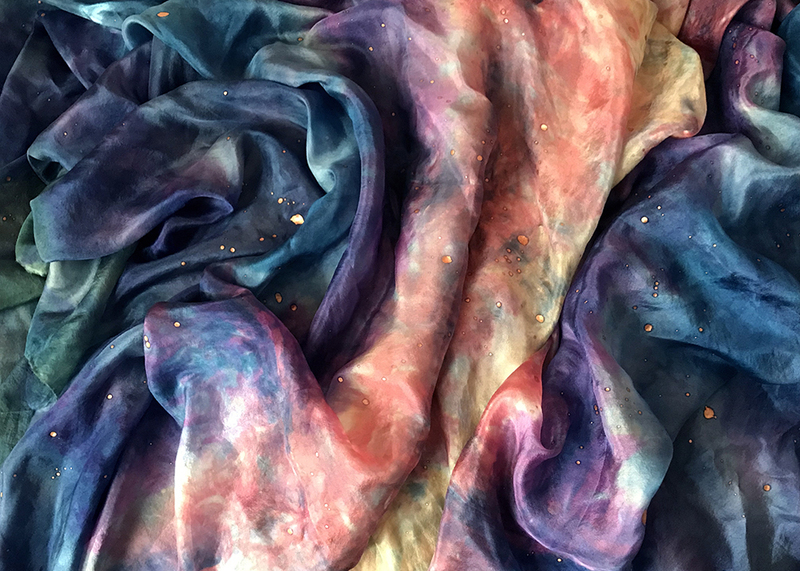 The name of the silk in this image is My Daughter. The colors in it are pea green representing serenity, indigo representing songs of deliverance, deep dark blue representing the presence of God, peacock blue representing fullness of His word, lilac representing shalom (the peace that surpasses all expectations), coral representing going deep with God, soft gold representing mercyand fresh anointing, cream representing childlike faith, and bronze shimmer representing the beauty of the Lord. Father, thank You for Your Everlasting Arms. Thank You for carrying us when we are weak or simply when we need to be held close (or You simply are of a mind to do so!). We love You. Help us to never neglect or take for granted the beautiful gift of intimacy we have with You. Thank You for being faithful to minister to our hearts and to break us through to the next level. You refuse to leave us behind. Thank You for that. We trust You. We trust Your heart for us. We choose You. Be glorified in our hearts and lives.